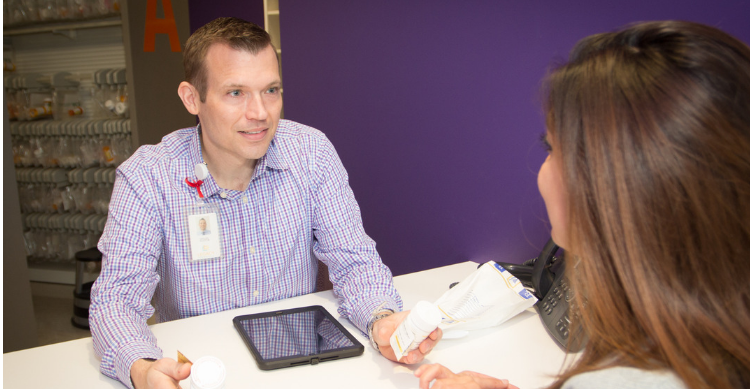 At Legacy, our pharmacists pick up a patient’s care where the doctor left off. Beyond filling prescriptions, they ensure people adhere to their medications, and do so safely. They provide blood pressure and blood sugar screenings, immunizations and one-on-one medication therapy counseling. Most importantly, our pharmacists strive to provide personalized care to everyone who walks through our doors. Integrating pharmacists into the broader medical team of doctors, medical assistants and nurses helps to improve health outcomes. That’s why the health center has opened two pharmacies inside their clinics in Houston’s Montrose and Fifth Ward neighborhoods, with a third pharmacy to open next year in the Gulfton area. Legacy recognizes that the high cost of prescription medications is often top of mind for the consumer. Insulin, for instance, can cost up to $300. HIV and arthritis medications also tend to be expensive. Our pharmacists help uninsured and underinsured patients receive their medications at a discounted price. The goal is to provide the patient with the right medication at the right time. “Recently, I helped an uninsured patient who was dealing with a gap period before his insurance coverage kicked in. I was able to get him a discounted copay card and connect him to our eligibility team to assist him in selecting an insurance plan for next year,” said Kevin Aloysius, Legacy pharmacist. Legacy Pharmacy accepts most private insurance plans as well as Medicare Part D plans. On the third Wednesday of every month, “brown bag” sessions are available for patients to meet with pharmacists to check blood pressure and/or blood sugar levels, review their medications and discuss ways to improve their health. The next meeting is February 20, 2019 at 12:30 p.m. at Legacy Pharmacy Montrose. We encourage those interested to join us.